Borneomag is free blogger template for magazine style. Cornermag is a simple, clean, modern and professional blog ideal for making a professional blogging and elegant websites. This template is totally responsive so it adapts to your style as well as the device it’s viewed on. It is clean and fresh style and high user friendly blogger template. Corner mag created by Herdiansyah and published on this site. Borneomag features include responsive design, smart thumbnail resize, label magazine style, menu navigation pages, label cloud edited, page navigation number, popular post edited, 2 column layout, white color background, comment edited, standart SEO ready, share social media button on homepage/postpage, back to top button and well documentation on PDF version. 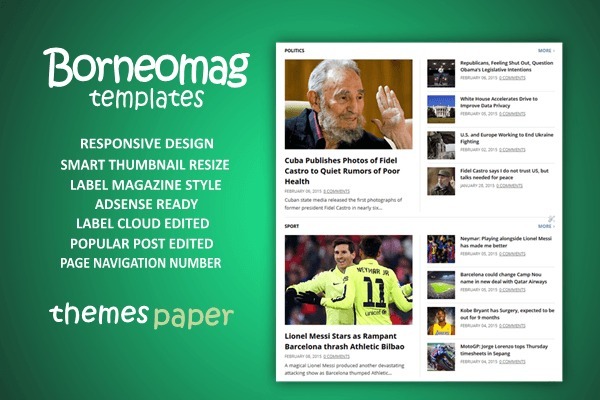 Borneomag is free template from Themes Paper, but you can choose premium option Only $5, has advantages such as you can remove footer link credits, no encrypted scripts, uncompressed CSS, you can use for unlimited domain, you will get lifetime templates updates and lifetime premium support from us. You can buy this premium version with PayPal button below and please confirm to themespaper [at] gmail.com after transaction. Yes, this website belong to us. So whatever templates we made, we will publish it here. Thank you for visiting us. Apakah bisa melakukan pembayaran via Bank Lokal ? Bisa, silahkan kirim email ke themespaper [at] gmail.com untuk pemesanan. Kemarin saya sudah transfer, mohon segera di kirim link downloadnya.. Trimakasih. Itu menu nya bisa di edit dari HTML gak mas? jadi gakusah dari Tata Letak . Untuk sementara, diedit via tata letak dulu ya. gan, itu bagaimana caranya agar tampilan widget bisa terlihat di versi mobile..
sama pos terkait juga gak kelihatan gan di versi mobile.... gimana ini? related post-nya kok gk muncul ya pak? Emailnya sudah dibalas, silahkan dicek. Terimakasih sudah menghubungi kami. Sudah dibalas mas Anto, maaf kalau late response. untuk link downloadnya dimana pak? Gimana templatenya mba bella, apa ada problem sejauh ini? Thank you.